A Welcoming Habitat . .
I’m glad I have several water features in my landscape for the sake of providing not only the soothing sound of coursing water but also to provide for nature a refuge from the intense Summer heat like we’re presently enduring here in the desert Southwest this week. Nature struggles in such intense weather just as we humans do. Today’s high was expected to be 120 Fahrenheit. Now, that’s intense! 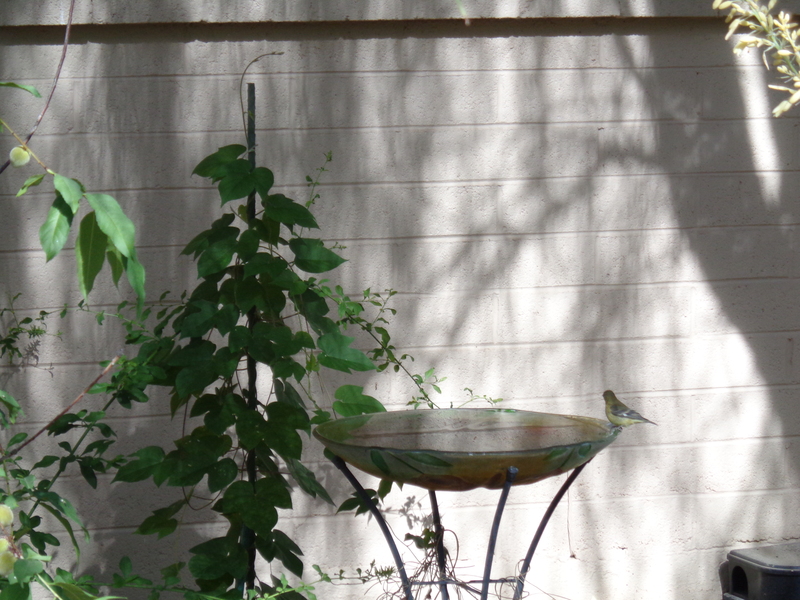 It’s evident when I look out my window to see several birds taking advantage of cooling down by sitting in the shallow birdbaths or taking a drink from a fresh, clean fountain. Water is important, as is providing safe places for all creatures to find shelter at all times of the year. In the desert, Summer is the most crucial time of year for provisional needs such as water, shade, protection, and food. Having a landscape which offers a variety of plant material as well as sources of nutrients and shelter for all the regular creatures which visit is a great way to make a daily theatrical show of nature’s best for you and your family! I was noticing some burrows being dug around my front shady border plantings. It’s from the quail, bunnies, and other birds which have realized how much more cool the soil is at the base of those regularly watered plants. So, I leave the burrows alone, knowing that the birds and rabbits which hunker down in them are finding some necessary relief. It doesn’t always look as nice with those burrows dug around the plants, but I let them be. And I keep all my water features full and clean during the Summer, which with birdbaths means that I am filling them each new morning due to evaporation and consumption. It might be simpler to not worry about such things in the heat of Summer, as the intense heat shortens my tolerance and time outside too. But, I realize how much the creatures which visit my yard have come to rely on the extra provisions I make available and I value having the chance to see them throughout the day! Each new day, as I water my potted plants early in the morning, I see to refilling the precious sources of water which keep the critters content! In the years I’ve lived here, I’ve become so used to the animals which have come to visit and to stay. There are tiny hummingbirds and predatory hawks. There are colorful peach-faced lovebirds and drabber birds which easily hide in our desert surroundings. I readily welcome the creatures, even though sometimes they provide a shock or an upset just by nature of their tenuous state as a living being. It’s all an acceptable part of living here because the beauty of having such diversity in my daily life and such a glimpse into God’s majestic hand of creation is more than worth any bother or momentary discomfort! Tomorrow morning I will again go out to water my plants, to tend to my landscape, and to provide for nature’s creatures even though I’ll have to go out early to beat the 118 F. forecast for our high temperature. Those many creatures don’t really depend on me for their provision, but they surely are offered a welcoming habitat here, especially when they may need some extra TLC! If you’re interested in providing natural habitats for more of nature’s critters, then I suggest you add some simple things to your yard. 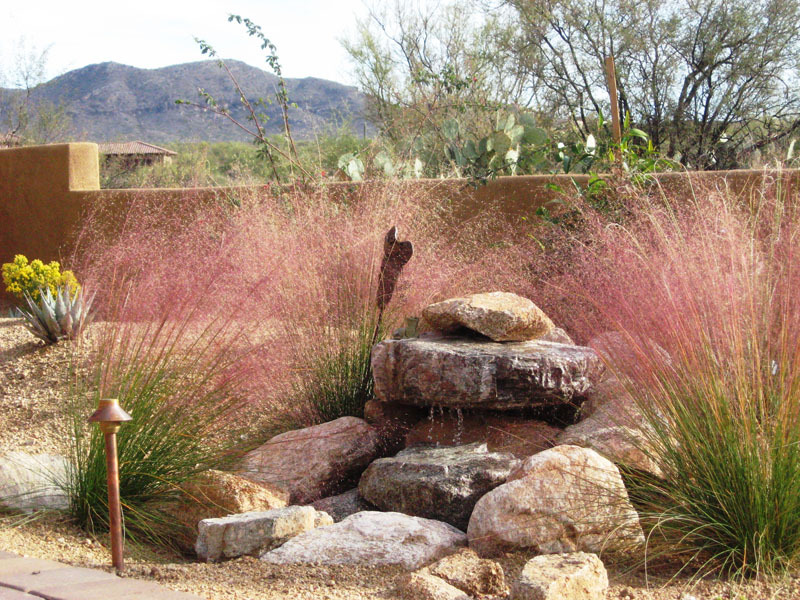 Just a fresh, moving water supply or one you regularly change is key, as well as food sources in the form of plant varieties and shelter in the way of plant textures and heights. These things are easy ways to offer food, water, shelter and interest for all sorts of creatures! If you do enough, you might even consider having your yard declared a wildlife sanctuary!